Quicksticks is based on the belief that small team games are enjoyable to play for both genders and all hockey abilities. The game is based on small sided game principles which make the game simple to play and teach, minimising danger, making the game more exciting, reducing stoppages and maximising playing time. Even if you don’t know anything about hockey we are confident you can deliver Quicksticks. We know many primary school teachers will not have any or little hockey knowledge so the Quicksticks Curriculum Resource and Challenge Cards have been designed specifically with you in mind. If you feel you need more guidance on how to deliver Quicksticks don't worry. England Hockey has a number of Quicksticks teacher training options available - to find out more click here! 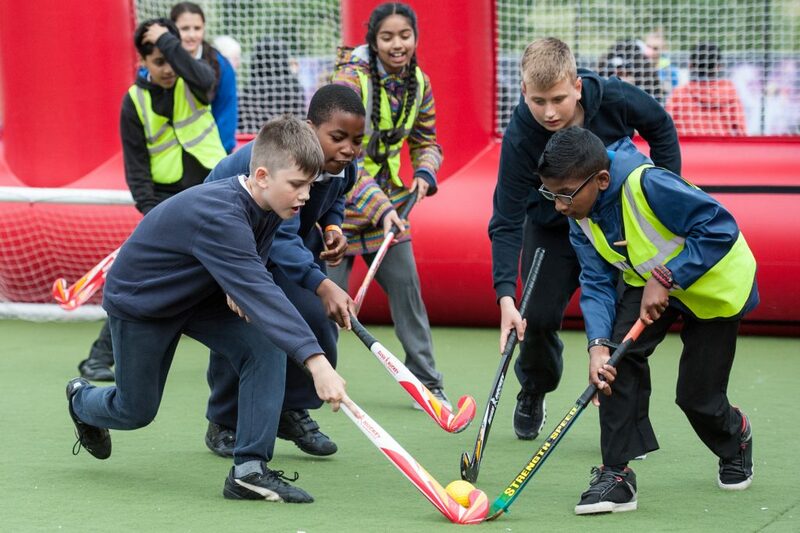 Quicksticks is England Hockey’s preferred format for primary school games hockey activity. The delivery resources make it ideal for intra-school delivery at Level 1 and inter-school delivery at Level 2. A free guide on ‘How to Organise and Deliver a Festival’ can be found in the festivals section of this website. This festival guide takes SGO’s or school staff through the process step by step, and is accompanied by a range of downloadable templates which provide everything you need. Delivery really couldn’t be easier! How could Quicksticks benefit your school? It offers a relevant progression from Key Stage 1 Multi-skill development. It is inclusive and provides a fun, flexible approach to high quality competition for girls and boys, whatever their ability. It is easily adaptable and helps develop essential motor skills, team spirit, social interaction and fair play. It can increase participation levels and offer more opportunities to engage young people in a wider variety of entry level school hockey competition. Interested in finding out more about hockey on a regular basis? Join the England Hockey Schools Membership scheme and keep up-to-date with the latest news on all things hockey – including Quicksticks, School Games, competitions, exclusive offers & opportunities and much more. Insurance and Responsibilities - Whether your Quicksticks activity is delivered by a teacher or a local coach please read our advice on who is responsible for the supervision and insurance of that activity HERE.